The Wallis Annenberg Center for the Performing Arts is a relatively new theater in the heart of Beverly Hills. 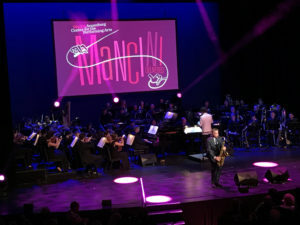 The family of the late, Oscar-winning composer Henry Mancini assembled an incredible lineup of talent as a fundraiser for the nonprofit organization on Saturday, April 1, and we were thrilled to be invited to cover it for Variety. The event, which featured Julie Andrews, John Williams, Quincy Jones, Kristin Chenoweth and many other stars, was a memorable concert of Mancini’s greatest hits, from Peter Gunn to The Pink Panther, “Moon River” to “Days of Wine and Roses” and more. Here is my story for Variety‘s online news page. This entry was posted in Composers, Film Music, Television Music and tagged Henry Mancini, John Williams, Kristin Chenoweth, Mancini Delivered, Quincy Jones, The Wallis, Variety, Wallis Annenberg Center for the Performing Arts on April 3, 2017 by Jon Burlingame.